Befitting the setting – and theme – the show began with a performance from Mimbre, a female-led group of acrobats who train and work in London. Dressed in matching monochrome outfits, they undertook a series of complex moves to a soundtrack by British-German composer Max Richter, culminating in them creating a ceiling-height archway with their bodies for the models to walk beneath. Joining Grazia Chiuri for her final bow, Mimbre’s appearance continued the designer’s championing of female performers: at her Spring/Summer 2019 ready-to-wear show, models walked among dancers choreographed by Sharon Eyal, for Cruise 2019, the show began with a demonstration of escaramuza, Mexico’s all-female rodeo. The collection felt distinctly influenced by the past: there was also something of the 1970s inherent in the silhouettes and finishings. High, ruffled necklines overflowed with structured pieces of tulle, sleeves ballooned romantically, and sequins in pastel shades were embroidered and inlaid into jackets, skirts and gowns. There was also plenty of metallic pleating – perfect for a Studio 54 showgirl. 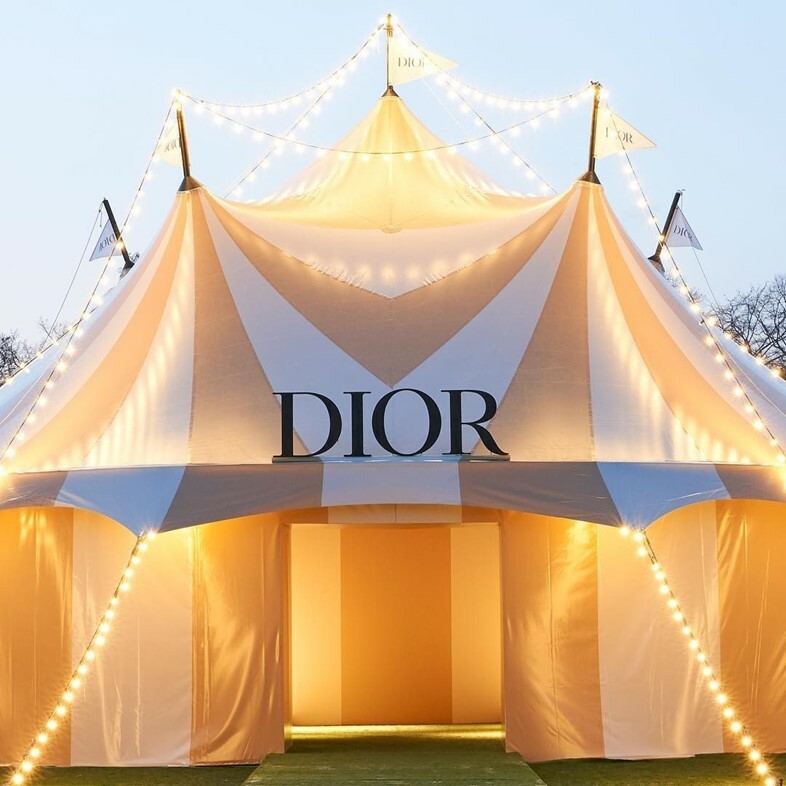 It was Christian Dior by way of Zandra Rhodes, but also – according to the show notes – inspired by Cindy Sherman’s Clown Portraits and Pablo Picasso’s costumes for the 1917 Ballets Russes performance Parade. Peter Phillips – creative director of Christian Dior makeup – transformed the models into contemporary Pierrot clowns, almost reminiscent of Serge Lutens’ 1970s iterations. Charcoal-black, kohl liner was smudged around eyes and pulled down on the lower-lid to form a dramatic, sharp point, whilst skin was kept paired back and natural. All this was brought together with a subtle slick of shell-toned gloss on the lips. Dazzling headgear was provided by milliner Stephen Jones, who chose swimming cap-esque hates, with pillbox netting delicately covering the face, worn by every model in gold, silver, black, bronze and white. And there were shoes to match: glittering mary-janes with criss-cross straps were teamed with low denier socks, where some other looks included ankle boots exploding with stars, for a youthful take on haute couture.